CHAT image hosted on the Wikispaces page for International Association for Research on Service Learning and Community-Engagement. Welcome to the next entry of my Reading Notes. I wish there could be slight moments of fanfare when your eyes drift over the words, but alas, technology has yet to match the madness of the mind. Ah, anyways, on to the real “reading out” performance: cultural-historical activity theory (code name:CHAT). Greece, home of Rhetoric. Image hosted on the website for NYU. Socrates and the Sophists. Image hosted on the wesbite RapGenius. From there, the writers relate how canons like “delivery” and “memory” have since become obsolete with the rise of literacy and then again with the emerging dominance of the digital. They make the case that instead of constantly reforming these canons, especially ones that no longer apply, to fit evolving demands of rhetors and audiences, new concepts (“mediation,” “distribution,” “mediums”) should be created: “Given these multiple limits, we argue that it makes more sense to begin remapping rhetorical activity, to trace distribution and mediation, than to attempt to retrofit this ancient tool to do varieties of work it was never designed to address” (“Core Text” 8). In order to map out for their readers why they wish to remap rhetorical activity canons, the authors draw upon those who have reconfigured applications of those five canons and those who point out flaws in their continuance. The example that stuck out most to me was the idea of delivery and how delivery had been more in the way the orator had presented himself/herself in tone, appearance, and so on, but now has to include elements beyond a person’s physical body and include choices in regards to how someone is filmed (camera angles were a part of the example). In the digital age, delivery would have to include, font styles and size, images included in the document/video file/blog/tweet/Facebook Message, what website the text appears on and in what format. This goes far beyond what the Greeks had intended and the idea of mediation and distribution does seem like better choices (especially in light of Cloud computing and social media outlets in a technologically globalized world). 2nd Attempt at Remapping Rhetorical Activity (“Core Text” 12). The list is longer but also now divided into different categories. Effectively, categories of canons in a digital age, each becoming nodes in a branching system. This CHAT project is very cool and reminds me a lot of the other theorists we have read so far. The section explaining exactly what CHAT is (remember that it is the cultural-historical activity theory, emphasis on the theory, though the practical applications are there too) seems to resonate with Spinuzzi’s discussion of worker agency in his book Tracing Genres, as happens with their discussion of how they see human activity within the framework of CHAT: “CHAT rejects the notion that human action is governed by some neo-platonic realm of rules, whether the linguistic rules of English, the communicative norms of some discourse community, or cognitive scripts for acting in a particular situation. It argues that activity is situated in concrete interactions that are simultaneously improvised locally and mediated by historically provided tools and practices. Those tools and practices range from machines, made-objects, semiotic means (e.g., languages, genres, iconographies), and institutions to structured environments, domesticated animals and plants, and, indeed, people themselves” (“What is CHAT?”). Again, there is the pushing back against the platonic, and now it goes beyond the five canons mentioned above, but what interested me most was the idea that “activity is situated in concrete interactions that are simultaneously improvised locally and mediated by historically provided tools and practices.” This sounded rather like what Spinuzzi was calling for when he suggested that information designers take the solutions of workers and integrate them into a system that was not such a universal solution that the “solution” only became another system for workers to tweak or work around. Ladies and Gentlemen, it is time to throw out your Neo-Platonic Rules for Human Activity Handbooks. Image hosted on Corbis Images. There was another quote I especially liked from the “What is CHAT?” section: “Distributed activity inevitably crosses social and historical boundaries so that activity, people, and artifacts are always heterogeneous. In activity, people are socialized (brought into alignment with others) as they appropriate cultural resources, but also individuated as their particular appropriations historically accumulate to form a particular individual. Socialization (learning) simultaneously makes people and societies because what is appropriated and individuated is also externalized in activity and, thus, alters the social.” This quote reminded me of both Popham (boundary crossing) and Foucault (socialization and individuation occurring simultaneously and altering each other in a cycle of human activity). I am intrigued by the image of a person being brought into alignment with social norms and knowledge, and yet becoming a “particular individual” in how they receive, adapt, merge, react again, and eventually absorb the experiences they have with society and culture. I may have been born within the same set of circumstances as my younger brother, but our experiences, personalities, and external factors have made us very different people; how we see the world, how we see human activity, how we interact with society, how we accept and discard parts of our two cultural heritages are not the same. It’s a very Wrinkle in Time kind of moment. On a side note: I definitely had a fangirl moment when I read Van Ittersum’s node on the Digital-Palace as it reminded me of the BBC’s new version of Sherlock with the great detective’s “mind palace.” While Sherlock does sport a mind palace much like I imagine ancient Greeks to have constructed within their own minds, this technique of Sherlock’s makes him more computer-like that ancient rhetorician. If we met someone whose memory functioned like the ancient Greeks, would we also consider them more cyborgian since our memories now seem to be intricately linked to the Google search bar on our smart phones? For one of the sections I chose to supplement the main body of this week’s readings, I chose JodyShipka and Bill Chewning “Live Composition: Four Variations of a Telling.” At first, I was a little disconcerted by the formatting of the presentation (not quite the right term, but it will do for now, I guess), but after I settled into reading and viewing the “live composition” Shipka’s student, Ben, as he worked towards Music Day, I found that I was really impressed with what the researchers and this student had done. The act of composing live changes the shape of rhetoric by combining elements of oratory (they do include audio files, but there is also the sense of composing in “real-time,” which is a term I pull from video games, because there was no time to refine the texts) as well as the semi-permanency of written compositions (the text may be in real-time, but it still has an archive of what occurred, what was written and said). The whole project was multimodal (images, sounds, words on a digital platform as well as having been written/drawn with pen-and-paper/pencil), becoming a networked project between the composer and the researchers. I want to spend a bit more time looking over the project before I apply any theories beyond the hardware theory, though I am leaning towards a desire to apply boundary genres. The other reading I chose was “Kairos and Community Building: Implications for Literacy Researchers” by Mary P. Sheridan-Rabideau. I chose this particular section mainly because of the community building in relation to literacy researchers as I wanted to see how a researcher would approach the restructuring of a community’s foundation when literacy and remapping rhetorical activities become something to sort of “take back” (not take back so much as adapt in the wake of a digital era that seems to enable our tendencies towards isolation, even when we are standing together in a room). The section was not quite what I was expecting (though it made more sense after I looked up exactly what kairos meant). I like how Sheridan-Rabideau slowly built up the practical applications of the remapping of rhetorical canons using the example of the Artist Now’s billboard and the process with which it was established by the community (politicians fighting, despite both being potential candidates for helping the organization) and then placing that artifact within its cultural and historical framework. Nothing exists in a vacuum, especially not community projects. I am curious to see how well CHAT is/will be/has facilitated the growth of Artists Now in light of Sheridan’s closing comment: “Such an inquiry into the everyday reasoning of rhetors requires a mapping of both the broad cultural-historic factors that shape the production of institutions and people and of the ways these productions become enacted in local contexts.” Like the statements from the section “What is CHAT?” about activity being both local and culturally-historically placed, this section became for me a concrete example of how this notion can be drawn out from the theoretical realm and into activities being done by people who are (or wish to be) actively engaged within in their own communities. Paul, Prior. 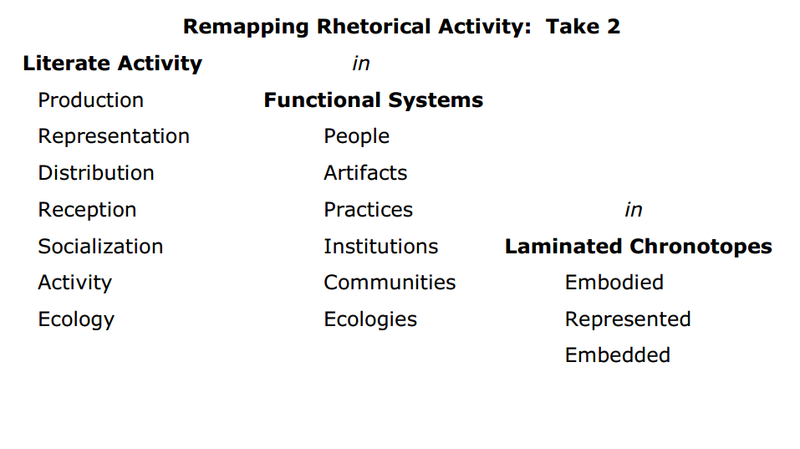 “Remaking IO, Remaking Rhetoric: Semiotic Remediation as Situated Rhetorical Practice.” Re-situating and Re-mediating the Canons: A Cultural-Historical Remapping of Rhetorical Activity. Kairos, n. d. Web. 15 Feb. 2014. Prior, Paul, Janine Solberg, Patrick Berry, Hannah Bellwoar, Bill Chewning, Karen J. Lunsford, Liz Rohan, Kevin Roozen, Mary P. Sheridan-Rabideau, Jody Shipka, Derek Van Ittersum, and Joyce Walker. “Webtext Core Text.” Re-situating and Re-mediating the Canons: A Cultural-Historical Remapping of Rhetorical Activity. Kairos, n. d. Web. 15 Feb. 2014. Prior, Paul, Janine Solberg, Patrick Berry, Hannah Bellwoar, Bill Chewning, Karen J. Lunsford, Liz Rohan, Kevin Roozen, Mary P. Sheridan-Rabideau, Jody Shipka, Derek Van Ittersum, and Joyce Walker. “Introduction + Navigation.” Re-situating and Re-mediating the Canons: A Cultural-Historical Remapping of Rhetorical Activity. Kairos, n. d. Web. 15 Feb. 2014. Prior, Paul, Janine Solberg, Patrick Berry, Hannah Bellwoar, Bill Chewning, Karen J. Lunsford, Liz Rohan, Kevin Roozen, Mary P. Sheridan-Rabideau, Jody Shipka, Derek Van Ittersum, and Joyce Walker. “What is CHAT?” Re-situating and Re-mediating the Canons: A Cultural-Historical Remapping of Rhetorical Activity. Kairos, n. d. Web. 15 Feb. 2014. Sheridan-Rabideau, Mary P. “Kairos and Community Building: Implications for Literacy Researchers.” Re-situating and Re-mediating the Canons: A Cultural-Historical Remapping of Rhetorical Activity. Kairos, n. d. Web. 15 Feb. 2014. Shipka, Jody and Bill Chewning. “Live Composition: Four Variations of a Telling.” Re-situating and Re-mediating the Canons: A Cultural-Historical Remapping of Rhetorical Activity. Kairos, n. d. Web. 15 Feb. 2014. Van Ittersum, Derek. “Data-Palace: Modem Memory Work in Digital Environments.” Re-situating and Re-mediating the Canons: A Cultural-Historical Remapping of Rhetorical Activity. Kairos, n. d. Web. 15 Feb. 2014. This entry was posted in ENGL894, Reading Notes and tagged Bill Chewning, CHAT, Community Building, Core Text, Data-Palace, ENGL894, Introduction, Jody Shipka, Kairos, Live Composition, Mary P. Sheridan-Rabideau, Reading Notes, What is CHAT?. Bookmark the permalink. So, do you think the mind palace is something that aligns with ideas of CHAT? Why or why not? I’m especially thinking of …(I just watched it last night and can’t remember the bad guy’s name), the bad guy’s mind palace that included actual filing cabinets. Isn’t a separate filing system the perfect example of something that disassociate ideas from related things?